A longer life expectancy and decreasing birth rates in developed countries represent the main factors contributing to a rapid growth of the aging population. Even in the case of normal aging, elderly people risk a gradual exclusion from social life and a worsening of their general well-being because of a decrease in some cognitive functions (e.g. memory) and because of changes in their social roles (e.g. retirement). Joined solutions exploiting the advances in medicine, psychology and technology are sought in order to support a dignified continuation of life characterized by independence and by satisfactory social participation. Information and Communication Technologies (ICTs) allow the implementation of solutions to improve cognitive and social activity for the elderly as well as the monitoring of their general conditions. 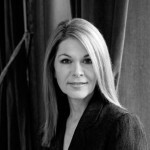 In the form of computerized exercise programs, ICTs can complement the intervention already provided by hospitals, health care centers and leisure centers, supporting psychological and neuropsychological treatment and rehabilitation through cognitive stimulation and training. In particular, videogames can be used to stimulate the cognitive abilities of both young and old users alike. Eldergames (“Development of High Therapeutic Value IST-based Games for Monitoring and Improving the Quality of Life of Elderly People”, ref. n. 034552) is an EUfunded international project that in three years completed the design, testing and production of an entertainment platform for elderly people to train memory, attention and reasoning. The game is divided into two main modules: Memogame and Minigame. Minigames are individual games randomly selected by the system to train a specific cognitive ability (memory, attention, reasoning and categorization). The Memogame is a social game requiring a player to pair his/her cards – representing images, sounds, or calculations – with the matching cards among those positioned in the central panel. Correct or incorrect pairing leads to receiving a bonus (extra time or extra turns) or to taking a Minigame, whose successful completion waives the assignment of a penalty respectively. Bonuses can be spent on a final multiplayer game offered at the end of the Memogame. The scores of all players are shown during the game and are permanently stored in an archive along with several indices of the players’ performance over time. Experts can access this archive to monitor the development or decrease in the users’ abilities. In fact, a comparison between the performances of 59 elderly participants in the Minigames for memory, reasoning, selective attention, divided attention, and categorization, and the scores obtained on the WASI (Wechsler Abbreviated Scale of Intelligence) test was carried out. No significant differences were found between the scores, showing that Eldergames can be used as a monitoring tool for cognitive functions. The specific needs of elderly users were taken into account both in the conception and in the development of the prototype. Regarding the concept, the risk that users could perceive the tool as too challenging and complex was considered. A mixed-reality tabletop solution was then chosen, in order to make the prototype appear as an elegant, ergonomic yet familiar object. The entire hardware system consists of five main elements: a customized table, a screen (a normal 47” LCD TV), 4 webcams, 4 pen-objects and a normal PC for running the software (Fig. 1). The users are comfortably sitting around the table, handling one pen each. By detecting the position of the pens with respect to the virtual objects appearing on the screen, the system allows the users to interact with the game. In this way, the elderly can take advantage of an advanced ICT without having to learn commands or to use unfamiliar input modalities. In the development of the interface, the starting point was the identification of a series of requirements that took into account specific usability needs connected to aging impairments in perception, memory and attention. From the first prototype to the last one, an extensive usability evaluation was carried out, where the fulfillment of the requirements was iteratively tested through methods such as checklists, cognitive walkthrough and video analysis. Emphasizing the social dimension of the game is important to keep the players involved and is a goal in itself given the risk of isolation for the elderly population. Up to four players can be involved in the Memogame at the same time, including players connected from different countries via the Internet. A communication system implemented in the platform makes interaction possible between speakers of different languages. The project involves engineers and usability experts from the academy, leading European toy manufacturers and testers, and elderly care centers. Being a game, fulfilling several usability requirements tailored to the elderly population and involving the participation of several players at the same time, the project consortium aimed at creating a tool to sustain the users’ motivation to engage in continuous cognitive training. The level of acceptance of the prototype, measured through specific questionnaires administered to 128 elderly people and experts in three different countries (Spain, Norway and the UK), showed that the platform was received very favorably. 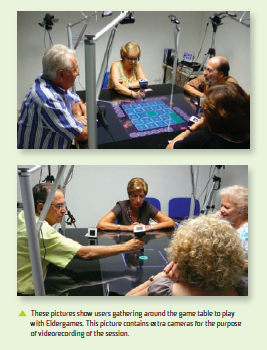 The hands-on experience gained at the various trial sites around Europe confirms that Eldergames provides users with an enticing ICT solution, that while appearing like an ordinary piece of furniture within a recreation center, contains all the tools necessary to connect, train and monitor the users. This project is supported by the European Commission under the 6th FWP (Sixth Framework Programme), Project Reference n° 034552; Start Date: 2006-09-01 – End Date: 2009-02-28.